After a delightful summer exemplified by a innovative tech conference, BarCamp Prishtina restarted the new season with another marvelous edition that comprised of interesting speeches and intriguing stories for the audience. The already-established community consisting of zealous people and powerful talks made this edition just as exciting as the preceding ones. 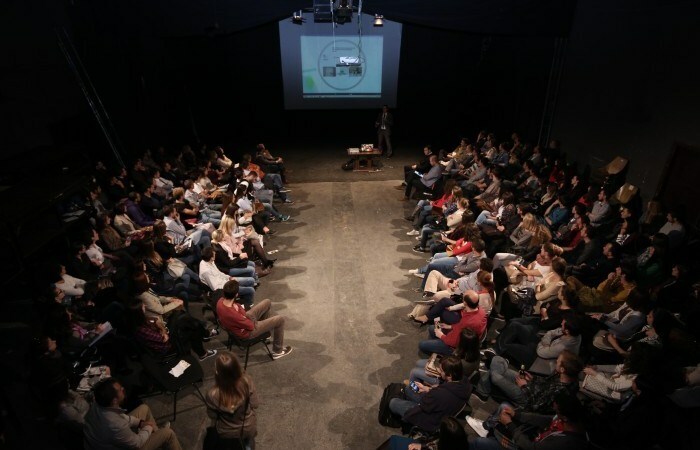 The main theme of the twenty-fourth edition of BarCamp Prishtina was Development through Technology, while the main purpose of it was to introduce the major breakthroughs that have established a solid base of a technology-oriented education and have inspired innovation among interested citizens of Kosovo through trainings and projects. Since BarCamps offer people a place where they can all share ideas and promote their innovative projects, this BarCamp provided participants with inspiring talks on how the interaction of education and technology has produced beneficial outcomes. These talks have surely inspired the participants’ and galvanized their creativity in an attempt to push them towards reaching the apex point of turning their ideas into reality. We invited five speakers consisting of: Visar Jasiqi who is currently the Chief of Party for USAID TLP – Immersion and Public Service Courses and AUK Training and Development Institute Director, Blerta Thaçi who leads and manages the initiative Girls Coding Kosova, Josh Harvey who leads and manages UNICEF’s Innovations Lab Kosovo, Edmond Qerimi who acts as VP of Engineering at EDUonGo, and Altin Ukshini who is the President of the Executive Board at FLOSSK and MOSSCon, Prishtina Hackerspace co-founder, and a Mozilla representative. Their main focus of discussion included the use of technology in their projects and the way it has aided the development of the Kosovar community. The BarCamp took place at the Oda Theatre, an area that provides a decent environment in which people can gather, socialize, share ideas, and prosper. Powerful talks engaged the participants’ minds, while fresh cold drinks kept the former receptive to thrilling discussions. The Barcamp had 151 registered participants eager to take part in discussions and listen to innovative ideas. Thus, it was nice to see that the interest was quite high, as it aids our attempts of increasing our BarCamp community and provide them with opportunities of personal and professional growth. Visar Jasiqi offered his insights on the latest project of A.U.K. Training and Development Institute called Female in IT, or simply FIT. As mentioned by the speaker, the necessity of having females within the IT sector is vast, as an imbalance is currently present. Thus, FIT project aims to balance gender inequality within this sector and offer females an opportunity to excel in professional terms and move away from the prevalent misconceptions that demote the skills of women and disregard their competence of building an IT-related career. Visar also put an emphasis on how the project is having an effect on the development of women, i.e. by developing their skills through trainings, in an effort to increase the 20% participation rate of women in the IT sector. Blerta Thaçi promoted the recent initiative called Girls Coding Kosova that aims to raise the number of women involved in the technology sector, specifically coding. She purported how the mission of the initiative is to encourage and empower women to start a lifelong process of putting technological tools, which are present in the 21st century, into practice. The audience expressed their interest in aiding the initiative by promoting it through any means necessary. Blerta also mentioned several projects that will be implemented in the future such as Rails Girls, Open Source Workshops, and Mobile Development Workshops. Josh Harvey started his interesting speech with a brilliant sense of humor that in turn engaged the audience to a greater extent. Josh talked about the principles for unlocking and accelerating innovation in the development context, including UNICEF’s globally recognized innovation principles. The latter principles were highlighted through several examples from the context of Kosovo and other countries, where Josh had been engaged in during his past work, such as Uganda, New York, Italy, and Jordan. He emphasized that change comes from anyone who cares enough about a certain problem and tries to find a way to solve it. While mentioning several projects that the Innovations Lab Kosovo is engaged in, Josh defined young people as drivers of social change, who must be given the opportunities to grow, take part in decision-making, and learn new things by doing. Edmond Qerimi started his presentation by taking the audience through his professional journey throughout the years. He told the story of how EDUonGo became an independent company, after being developed through the ranks of RealVisualZ. EDUonGo is now an online service that offers education to its users without any financial obligation. Moreover, the platform has used technology to inspire innovation and development through its open source policy. Edmond informed the audience that this service is also used by Washington Education in Kosovo, from which thousands of students are expected to be involved in innovative projects and reach development by using this technological breakthrough. Altin Ukshini presented the recent and upcoming projects of Prishtina Hackerspace, which acts as a community-operated workspace where people with a common interest in technology meet, socialize, and collaborate. Comprising of individuals from various backgrounds, Prishtina Hackerspace has managed to work on projects such as Autoshkolla app, Wiki Loves Monuments, Software Freedom Kosova 2014, and a Kickstarter campaign. Altin also presented the digitized book scanner that aims to convert books into electronic form; hence, complying to the open source ideology. Another BarCamp has passed by and another set of thrilling stories has been shared. Nevertheless, plenty of brilliant stories and projects remain to be disclosed in the upcoming months. Until then, socialize, collaborate, inspire, and innovate! See you soon in BarCamp Prishtina #25.